[Editor’s note: Below is the debut guest post of Arish Narayen. Arish is 23-years old and is currently in his second year at the University of Maryland School of Law. Arish has always been a basketball fan, especially of the Terps, but became enamored with the Wizards around the time Gilbert Arenas was hitting game winning shots and stealing game five from the Bulls in Chicago in the 2005 NBA Playoffs. The Wizards have gone nowhere but downhill from since, but somehow Arish has stuck around … and now he wants to write about the Wiz for Truth About It.net. Go figure. Last February, the Wizards traded Caron Butler, Brendan Haywood, and DeShawn Stevenson to the Mavericks for Josh Howard, Drew Gooden, James Singleton, and Quinton Ross. A few days later, the Wizards traded Antawn Jamison to the Cavaliers in a three team deal which netted Washington Al Thornton, Zydrunas Ilgauskas’s corpse/expiring contract, Cleveland’s 2010 first round pick, and someone named Emir Preldzic. Both of these moves were straight salary dumps, a last ditch effort by the Wizards to obtain value for a veteran core that never got past the first round of the NBA playoffs. 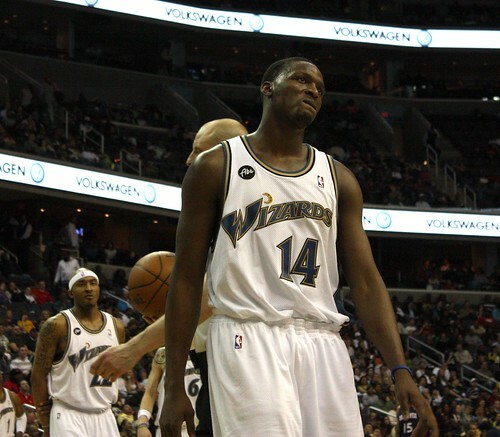 Even Josh Howard, the only all-star the Wizards obtained in return, likely won’t be back in Washington for 2010-11. Team president of basketball operations Ernie Grunfeld is left with the tall task of rebuilding the Wizards around John Wall and Andray Blatche (and perhaps a few ‘wait-and-see’ rookies) – but all of the other roster spots are seemingly wide open. Considering Arenas’ move to the two-guard, a wing player who can defend and stretch the floor for Wall and Blatche seems like the most glaring need, and could be a part of Grunfeld’s and team owner Ted Leonsis’ ‘tortoise’ approach. So far this offseason, the Wizards have made some questionable moves with teams that are looking to win the LeBron sweepstakes (although now it looks likely that neither the Nets nor Bulls will). Enter Yi Jianlian, Kevin Seraphin, and Kirk Hinrich. Let’s just hope these guys don’t keep hand-cannons in their lockers. According to multiple league sources, they [the Wizards] have already contacted the representatives for Mike Miller, Josh Howard, Josh Childress, Travis Outlaw, Rasual Butler and Ryan Gomes, hoping to address their need for a veteran wing player. Thus, because the Wizards do not have the money to pursue an upper echelon small forward, they are likely left with the above list and the players already on the roster (another cheap big to supplant JaVale McGee or other cheap free-agent fillers notwithstanding). Josh Howard provided some quality minutes in his few appearances after the Dallas trade, but pursuant to 2009-10 Wizards’ Law (Murphy’s Law doesn’t quite describe it), Howard’s season ended prematurely when he tore his ACL. Already, the Wizards have chosen not to exercise their $11.8 team option on Howard for 2010-2011, a move which the organization may have planned on making all along. According to Yahoo! 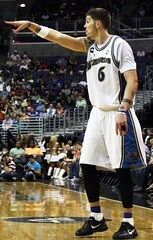 Sports, Mike Miller is garnering significant interest from league executives. This is not surprising. Over 54 games for the Wizards in 2009, Miller had an eFG of 59.6% and shot 47.9% from behind the arc (good enough for second highest in the NBA), averaging 11-6-4 for the season (points, rebounds, and assists). There are countless teams who could use Miller as a third scoring option who provides spacing on the floor. Whether Miller would make a good small forward for the Wizards remains to be seen, but given that he has already stated his desire to play for a championship caliber team, it is doubtful he rejoins the Wiz. 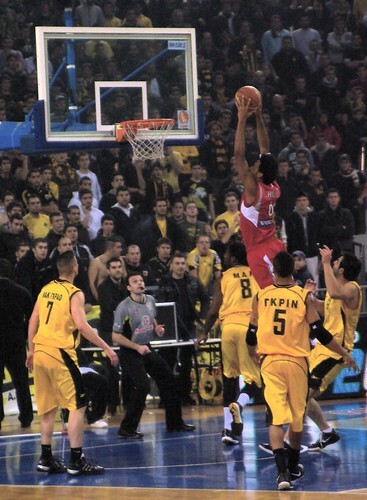 Josh Childress has been playing for the Greek team Olympiacos since the summer of 2008. Childress’s deal with Olympiacos is worth around $20 million guaranteed over three years, with an opt out clause after the first two years, meaning he would have to opt out this year to return to the NBA. Childress is an interesting player. His Win Shares per 48 minutes (an estimate of the number of wins contributed per 48 minutes where league average is 0.10, Win Shares further explained here) increased each of his first four seasons in the NBA – from 0.093 in 2004-2005 to 0.16 in 2007-2008. Childress has never been able to shoot from distance (he averaged 0.8 3pt attempts per game in 2008) yet his eFG was 59% the year he signed to play overseas, suggesting remarkable efficiency from mid-range and close to the basket. While getting Childress would be nice, it seems unlikely. Childress’s deal with Olympiacos is one of the most lucrative contracts in European basketball, and the Atlanta Hawks still own his rights (although, with them giving Joe Johnson a max contract, they might not be able to afford matching an offer to Childress). Coming to an inexperienced Washington team that will most likely be in flux for the next couple years cannot be more desirable than either playing on a championship team in Europe or joining the Hawks/another playoff team. Travis Outlaw was not very good last season, but it’s hard to determine how much of that was due to injury. 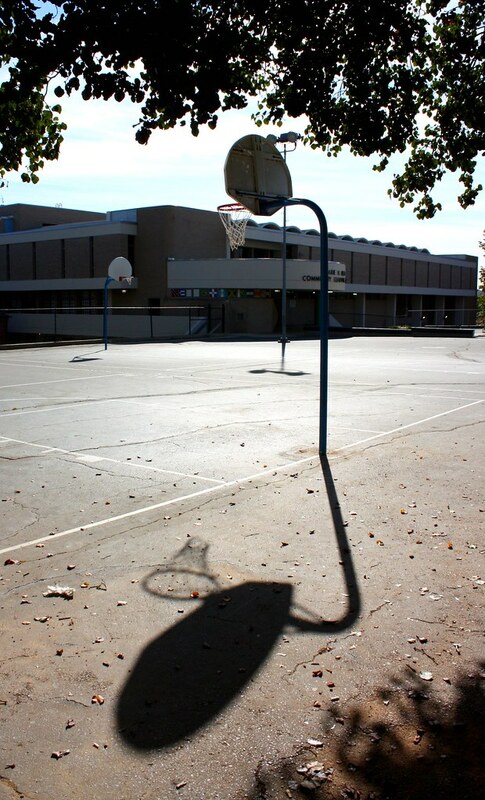 On November 14th, while playing for the Portland Trailblazers, Outlaw fractured his left foot. He didn’t appear in a game until more than three months later on February 22nd, and by then he was playing for the LA Clippers. In 34 games for Portland and the Clip Show, Outlaw had an eFG of 46.3%, contributing 0.062 Win Shares per 48 minutes. However, 34 injury-plagued games is an uncertain sample size – perhaps looking at Outlaw’s 2007 and 2008 campaigns (where he appeared in 163 total games for Portland) will give us a better idea of his value. Averaging Outlaw’s 2007-08 and 2008-09 seasons together, he was worth 0.092 Win Shares per 48 minutes. Taking into consideration the ‘mailing-it-in-because-I-got-traded-to-the-Clippers’ factor, Outlaw is probably not as bad as last year’s numbers indicate. A look at Outlaw’s “clutch” stats on 82Games.com (where clutch is defined as 4th quarter or overtime, less than 5 minutes left, neither team ahead by more than 5 points) from 2007-08 shows that he averaged 29.2 points per 48 minutes of clutch time, ranking 39th in the NBA (worth noting: Al Thornton was ranked 35th in “clutch” scoring that season). In 2008-09, Outlaw scored 23.4 points per 48 minutes of clutch time, ranking 68th. In 2009-10, Outlaw dropped to 21.3 points per 48 minutes of clutch time, tying him with Luke Ridnour. Given that the 2009-10 numbers are skewed because Outlaw played in only 34 games, these clutch numbers show that he can be a reliable complimentary scorer in crunch time when the defenses tighten up. Notwithstanding last season, Outlaw’s true talent level is likely closer to that of a league average forward; he could be even better provided improves his ball-handing and he stops relying so heavily on his jump shot (according to some crunching of the numbers from HoopData, 62.3% of Outlaws FGAs over the past four seasons have come from 16 feet and beyond; only 26.4% of his attempts come within 10 feet). Because he still has time to improve at age 25, has length and athleticism to finish around the rim, and because he likes The Boondocks, Outlaw is definitely a player the Wizards should consider signing (again, at the right price). Rasual Butler turned 31 in May and is set to enter his 9th season of mediocrity. Butler is a career 40.5% shooter who had an eFG of 49.3% last season. Averaging 33 minutes a game for the LA Clippers, he contributed only 0.048 Win Shares per 48 minutes in 2009-10. Butler’s rebounding numbers were equally poor, as his Total Rebounding Percentage reached a career low 5.1% last season. To his credit, he is a good ball handler, averaging only one turnover per game in 2009-10, and will likely be the cheapest, most experienced small forward available. However, given his age and general worthlessness, the Wizards should not sign Rasual Butler…unless they only want a one-year bargain backup for Thornton. Providence product Ryan Gomes contributed 0.052 Win Shares per 48 minutes last season for the Minnesota Timberwolves. Gomes is an interesting case – his career eFG of 48.9% is solid. However, Gomes is terrible on the other end, contributing 0.9 Defensive Win Shares in 2009-2010. According to Synergy Sports Technology’s % Score data, (a measure of scoring efficiency depending on situation), Gomes allowed his man to score on 46.5% of isolation plays that ended in a FGA, TO, or FTs (0.93 points-per-possession) and 44.3% on spot-up shots (1.1 ppp). If isolation situations tell you something about a player’s defensive intensity, then Gomes has the intensity of a small girl. For a team that desperately needs to improve its defense on the wings, the Wizards simply cannot afford to sign Ryan Gomes. The Wizards currently have pseudo-options at small forward in Thornton, Jianlian and Nick Young. Because the Wizards can choose whether or not to extend a Qualifying Offer to any of these three after the 2010-11 season, each has essentially been granted a one-year audition. Intuitively and statistically, Thornton is the best choice at small forward out of the three. Young was an efficient scorer in isolation sets, (45.7%, 0.91 ppp) coming off screens, (45.5%, 1 ppp) and in transition (54.3%, 1.14 ppp) last season. He even had a decent year behind the arc, making 40.3% of his 3s. But his value diminishes drastically on defense. Last season, pick-and-roll ball handlers scored 50.5% of the time versus Nick (1.01 ppp). Spot-up shooters converted at a 43.5% clip (1.07 ppp). In essence, Nick Young can do some nice things for you offensively. Just don’t ever ask him to fight through a ball screen, or make the correct decision on pick-and-roll defense. I would be singing Nick Young’s praises if he could do something other than score. But it is clear that he does not have much interest in creating opportunities for his teammates (0.9 assists per game for his career), in rebounding (1.6 rebounds per game for his career), or in bulking up to play defense. It seems to me that if a starting wing player is not one of the two most efficient scorers on the floor, then you need him to create opportunities for others, or deny the opponent’s most potent perimeter threat similar opportunities. Al Thornton has little capacity or inclination to do either of these things. A look at the numbers indicates that, in his short time with the Wizards this past season, Al Thornton was a very efficient scorer in transition (68.4%, 1.29 ppp), and off of offensive rebounds (61.9%, 1.14 ppp), but not very efficient with his spot-up shots (41%, 0.85 ppp). However, Thornton’s numbers with the Wizards suffer from the small sample size problem alluded to above, so perhaps his numbers with the Clippers can offer some insight. In Los Angeles, Thornton excelled in transition (66.2%, 1.35 ppp) and cutting to the basket (58.9%, 1.23 ppp). But his numbers as a spot-up shooter on the Clippers were similarly mediocre (41.8%, 0.89 ppp). With a burner like Wall pacing the offense, the Wizards need someone who can run the floor and finish strong in transition. Thornton has shown such a skill set. What is also remarkable is Thornton’s defensive numbers last season. While languishing on the Clippers before the trade, opponents lining up for spot-up shots versus Thornton converted only 33.1% of the time (0.82 ppp). In isolation sets, opponents scored on him only 41.6% of the time (0.82 ppp). In Washington, Thornton was an even better 1-on-1 defender. With the Wizards, spot-up shooters scored on Thornton 29.4% of the time on 51 attempts (0.75 ppp) and in isolation situations, opponents scored only 30% of the time on 60 attempts (0.68 ppp). However, the news isn’t all good. While Thornton may be a slightly above average 1-on-1 defender, his commitment to team defense needs a lot of work. In LA, pick-and-roll ball handlers versus Thornton scored 46.9% of the time (0.94 ppp) on 49 attempts; coming off screens, opponents scored 47.6% of the time (1.1 ppp) on 42 attempts. With the Wizards, pick-and-roll ball handlers scored 50% of the time (1 ppp) on 36 attempts; opponents coming off screens scored 40.9% of the time (0.86 ppp) on 22 attempts. Despite Thornton’s troubles with operating around ball screens, and as hard as it is to believe, he might be one of the better perimeter defenders the Wizards have right now. The fact that the New Jersey Nets traded Yi Jianlian for Quinton Ross in order to save $3 million cap dollars is not really a point in Yi’s favor. What we know about Yi: he’s a 7-footer who had an eFG of 41.7% last season. The Nets mostly used Yi as a spot-up shooter (42.9%, 0.88 ppp) outside of the paint, as his offensive game is comparable to a “stretch 4.” I actually liked the Yi acquisition (he’s like the Chinese Antawn Jamison-lite minus the ridiculous scoop shots) but asking him to play small forward would be a mistake. By virtue of his height, Yi likely does not have the lateral quickness to guard the plethora of versatile scoring wings there are in the League – he would get taken off the dribble repeatedly. And if the Wizards are ever going to improve their defense, they need a perimeter defender who can stop ball penetration and close out on shooters. Thornton is best suited for this job: he has the size, athleticism, and perhaps even a chip on his shoulder regarding his defense. (For a complete breakdown of Yi’s game, including how awful he is defensively, see John Townsend’s piece on TAI). Yi would be better suited at power forward, his natural position. Yi looked good playing off the ball last season, especially cutting to the basket (56.3%, 1.05 ppp). He would also have an easier time running the floor in transition as a power forward rather than playing the three and expending all of his energy trying to keep up with athletic freaks of nature like LeBron. The Wizards might get a look at Yi in the starting unit anyway, as there’s a chance Blatche won’t be ready for the season opener because of a fractured right foot, in which case the hypothetical starting lineup would be Wall/Arenas/Thornton/Yi/McGee. In conclusion, amongst those discussed, the Wizards should either sign Josh Childress (without overpaying) or Travis Outlaw, and also wait and see what they have with Al Thornton. Regardless, the Wizards should not commit too much money to a player who’s not a part of ‘The Future Plan,’ especially if the organization wants to make a serious run at Baltimore native Carmelo Anthony in the summer of 2011 (assuming he turns down the 3-year, $65 million extension offered to him by Denver). Addressing the weakness at small forward certainly isn’t a must, as Thornton possesses some useful skill sets. But signing a player like Outlaw would provide a good insurance policy against two things: 1) the possibility that Thornton plays poorly, and 2) the possibility that the Wizards do not acquire Carmelo next summer. The future is bright for Wizards fans, but the organization must first intelligently address the team’s major weaknesses if they expect to be relevant outside of the simple presence of John Wall next season. Opening Statements 09: Wizards at Bulls — Why is Washington so Bad at Defending the 3?